Building a reliable list of contacts and references is an important aspect of any job, and Gmail has a built-in contact list that will sync up with your phone, and even Outlook. What though if you accidently deleted an important contact, or imported an unwanted list of email addresses? Earlier this month Google added a feature similar to Windows “System Restore,” except that it will completely restore your Contacts list to an earlier time. 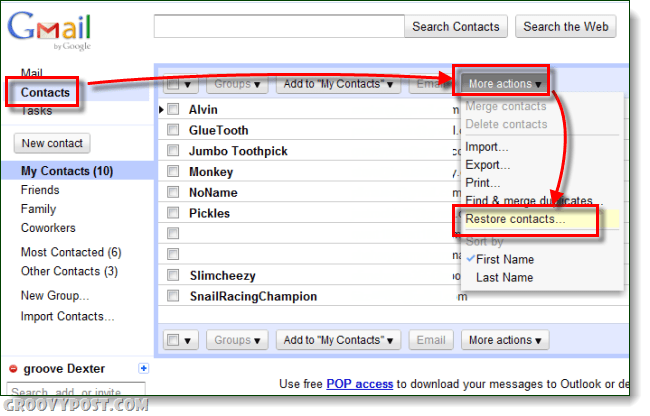 Important: Restoring your Gmail contacts will completely undo anything you’ve added or removed from your contact list since the destination restoration. In other words, imagine that you took a snapshot of your contacts list at x time, restoring make your contacts list exactly the way it was at x time. But not to worry, if you restore too far back, you can just revert forward to 1 minute ago and undo the entire restoration. 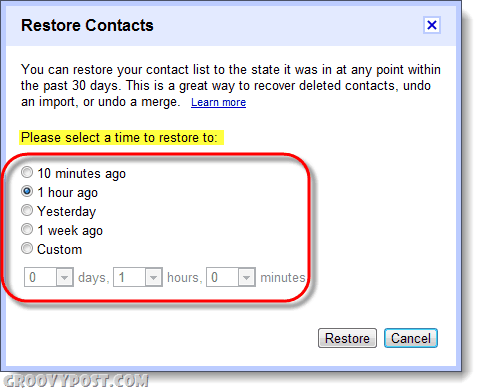 Select the date / time that you would like to restore the entirety of your Gmail Contacts to. Click Restore. Now your contacts database will appear and function exactly like it was at the time you specified in Step 2. Contacts that were newer than the specified date will be gone, and any contacts removed after the specified date will be restored. While it’s not a huge feature update, it sure is a groovy one!